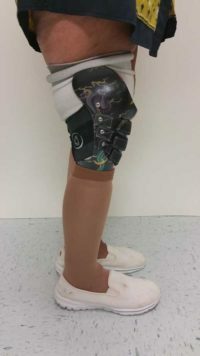 Donna – CJ Socket Technologies, Inc.
Donna is a 58 year-old who lost her right leg below the knee in 1985 when she was hit by a car. 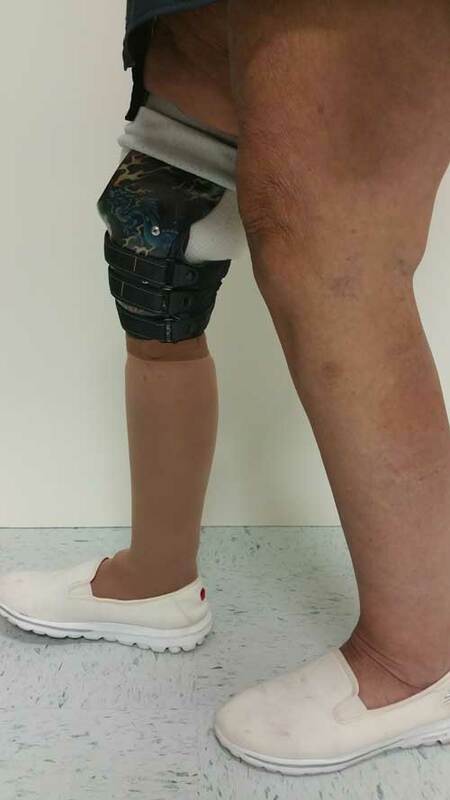 The residual limb is very short with full thickness skin grafts covering 80% of its surface. She historically wore a conventional fixed volume socket with locking gel insert. Over the last several years, Donna suffered chronic skin breakdowns which required extensive wound management and prevented her from wearing the prosthesis for several weeks at a time. Test socket attempts with similar replacement sockets were largely unsuccessful. 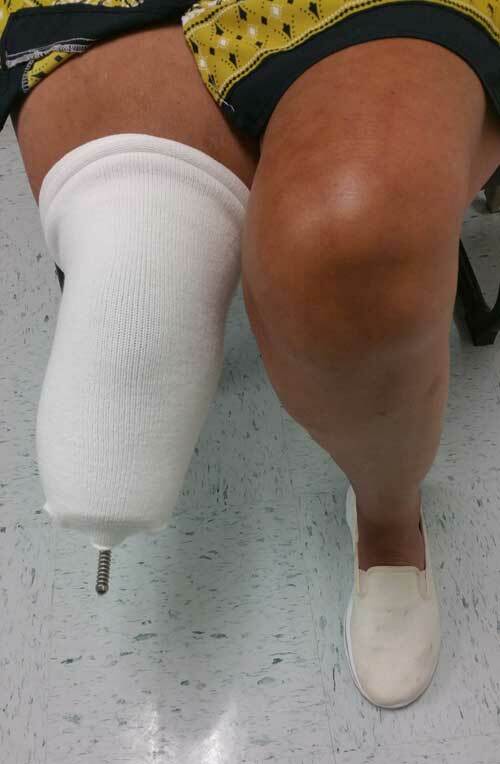 She could not maintain a proper fit due to daily residual limb volume changes despite her years of experience adjusting the conventional fixed volume socket with socks. The Sail is loosened fully to allow the residual limb to slide easily into the socket with proper distal contact. 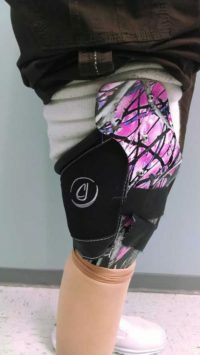 The Sail is then tensioned using the Velcro closure to match the limb volume, thus eliminating the need to squeeze into the socket. Once properly tensioned, the socket fit is precise providing proper weight bearing and skeletal control. The CJ Socket allowed Donna to easily snug the socket during the day and maintain proper weight bearing. As residual limb volume is lost during the day, the sail is easily tensioned to accommodate the lost volume. Donna typically adjusted her sail several times during the day allowing her to maintain a proper fit and consistent skin integrity. 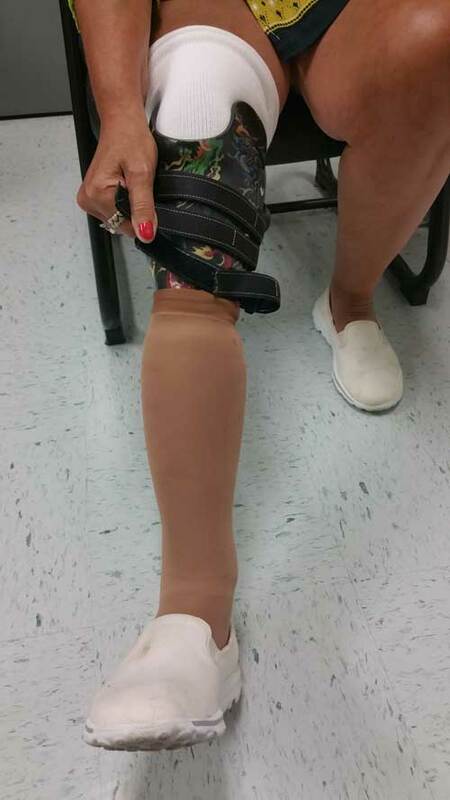 She does not have to doff and don the prosthesis to add socks and her wounds quickly healed. She is back to her baseline K3 ambulation. 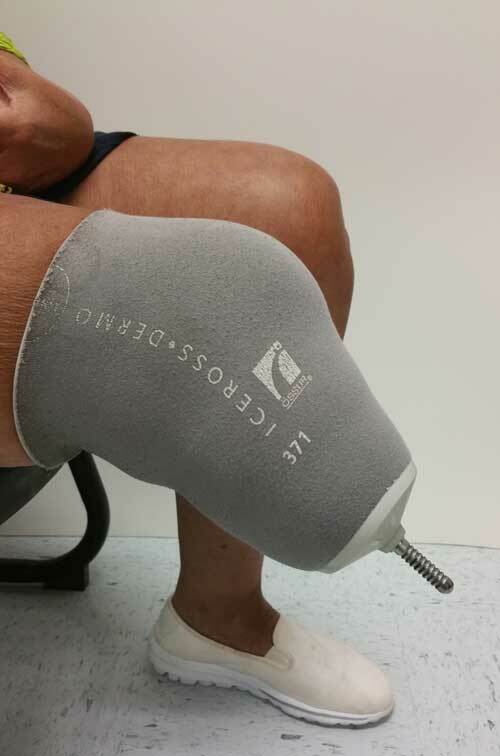 The CJ Sail is unprecedentedly flexible and can be positioned 1 inch higher than conventional transtibial fixed volume socket posterior walls. This provides excellent sagittal plane control while still providing unencumbered knee flexion.